Pregnancy is a time filled with unknowns. If you are expecting your first baby, there’s so much to learn, read, and do. It can be overwhelming, to say the least! And before you can really dive into the new information, you have to figure out a way to get a good night of sleep. While you might be tempted to just sleep as you normally have been, there are several rules to follow during pregnancy. The following guide will help you understand the best sleeping position for pregnant women in each trimester. If you are newly pregnant, it may be hard to imagine why sleep during pregnancy is any different than typical sleep. But once you look at everything that is going on in a pregnant woman’s body, you can begin to understand the issues. The first trimester can bring nausea, hot flashes, and even insomnia. All of these ailments can change your sleep habits. Therefore, making it much more difficult to enjoy your usual sleeping positions. The second trimester brings a growing bump, along with joint looseness that can cause pain and aches. In the third trimester, your belly will be large enough that switching positions in the night can take more effort than you may be able to give! However, just because it can be difficult to sleep while pregnant, doesn’t mean it has to be. Get started early and train your body to rest. Therefore allowing you to use the best sleeping position for pregnant women before it becomes too hard to sleep at all! During your first trimester, your body will be going through hundreds of small changes. While you may not look different from the outside, on the inside, you can feel it. Generally, during this time, your body has not yet changed in size, so it is safe to continue sleeping in whatever position feels comfortable to you. However, you may want to start training yourself to sleep on your side! It is a lot easier to sleep on your side later if you get started now. It is hard to get into a side position if you are used to sleeping on your back or belly. So be sure to to prep your bed for luxurious comfort. Start out by purchasing a pregnancy pillow. There are many different styles and designs. So, try out a few to see what suits you better. Since the best sleeping position for pregnant women during the first trimester is whatever they are most comfortable with, you can use this time to get as much sleep as you can! Now the real fun beings! Once you enter the second trimester of pregnancy, your body is likely showing some big changes. Namely, your belly is expanding! At this point, sleeping on your belly is likely no longer comfortable. Although, you can still sleep on your stomach if you don’t feel any discomfort. A pregnancy pillow can give you extra support if you would like to sleep in this belly down position for a few extra weeks. But, don’t forget that soon enough you will have to mix it up. That’s because during the second trimester, the safest and best sleeping position for pregnant women is on the left side. When sleeping on your left side, blood flow to the placenta, heart, and extremities of your body is at its strongest and fullest. Your body will be getting all of the oxygen-rich blood it needs. Thus, keeping you and baby safe! If you have trouble staying in a side-lying position, use a pregnancy pillow or wedge. This helps keep your body stable. Using a special pillow will also help position your hips, knees, and spine into a straight line. This will be perfect for keeping you pain and ache free. By now, you are well versed in how hard it can be to sleep while you are pregnant. At this point, you may be experiencing ailments like heartburn, sore hips, and an achy pelvis. During the third trimester, it is no longer recommended that you sleep on your back. Laying flat on your back can cause shortness of breath, and the heaviness of your baby and uterus can compress your arteries in an unsafe manner. If you had slept on your back up until this point, you may find it difficult to suddenly re-arrange your bed. Try using your pregnancy pillow or wedge to get your body into a supported position. The pillow can help you stay stable on your left side, while also supporting the rest of your body. Since the best sleeping position for pregnant women in the third trimester is on the left side, avoiding back sleeping is wise. Likewise, if you had been comfortably sleeping on your belly up until this month, now is the time to switch it up. If you use a larger pregnancy pillow, you will be able to adjust it around your body. This can almost trick you into feeling like you are sleeping on your belly, while in fact you are sleeping in the left side position. 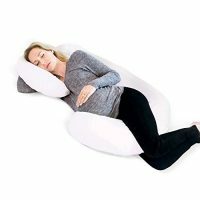 The pillow will take on the weight of your belly, allowing you to relax and fall into a deep slumber. Hands down, if you want to sleep safely, comfortably, and deeply in any trimester, try to do so on your left side. Your body becomes well aligned and able to keep blood flowing well to all areas. And, your joints supported resulting in reduced heartburn, pain, and other sleep issues. 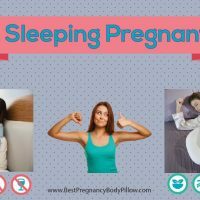 Be sure to check out our pregnancy pillow buyer’s guide to find the perfect pillow to assist you in finding the perfect sleeping position for pregnancy. Sleeping during pregnancy will feel like an entirely different process. However, by following this guide, you will be able to get a full night of sleep. Need a little extra help? Consider keeping your room a little cooler and darker than usual. Pregnancy can make you feel overheated very easily. A nice bath or some aromatherapy before bed can also help you fall into a deeper sleep. Once you do make it to bed, always remember to slide to your left side if you want to get into the best sleeping position for pregnant women. Once you are comfortable, enjoy your rest, and get as much sleep as you can before baby arrives!